The Barry Sand & Gravel Company's 2ft gauge line came in from the beach and made a right-angle connection with the gasworks siding at a high level; trans-shipment into the standard gauge wagons beneath was by means of a loading chute. The track was of the portable type and its alignment at the seaward end frequently suffered from tidal wash. As the sand and gravel was despatched unwashed the only buildings necessary were an office and engine shed. The track layout consisted of a main line, with a wagon turntable at the loading chute end, and a permanent siding into the loco shed; the remainder was made up of temporary sidings. Only one 2ft gauge locomotive worked here and it is presumed to have been broken up in 1925 when the works closed. Named MENA it was an 0−4−0 well tank despatched new from Hudswell Clarke & Co. Ltd., Leeds, on 30th January 1913; the makers' number was 1019, and the price £400. It was a diminutive machine with 6in by 9in cylinders, 1ft 8½in wheels, 3ft 4in wheelbase, 180lbs boiler pressure, and weighed just 5½ tons. The rolling stock consisted entirely of steel side-tipping wagons, maker unknown. I am indebted to Charles Davies (of Porthcawl) and R. N. Redman for information, and to C. G. Down for providing me with a sketch of the track layout. Another firm, the Porthcawl Sand & Gravel Co. Ltd., was also in business in the area, but probably did not commence operations until after the demise of MENA. 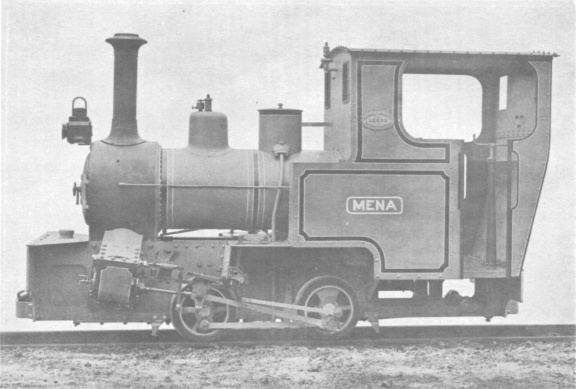 Messrs Motor Rail Ltd. delivered three 2ft 0in gauge petrol locomotives to this firm at their 'Newton Point' pits; numbers 5419 and 5420 in 1934, and 7060 in 1938. The ultimate fate of these machines is unknown, and it is not known whether the line on which they worked was connected in any way with the system operated by MENA.